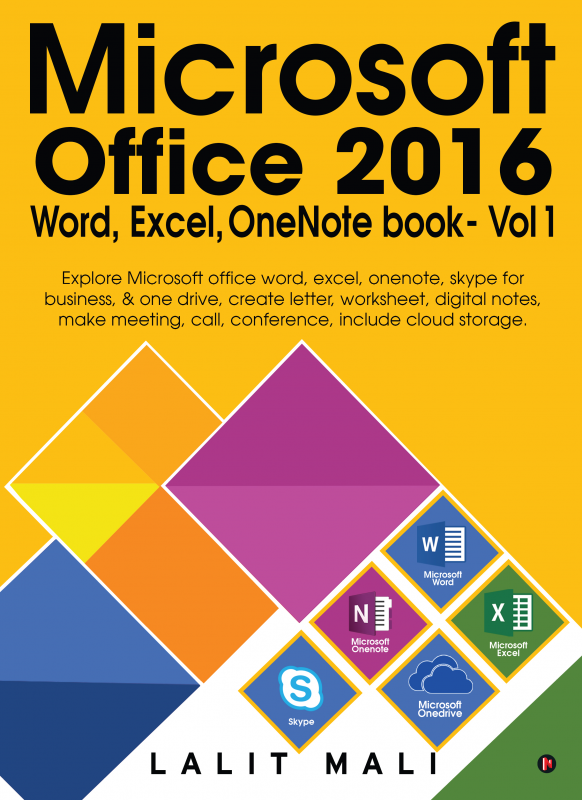 Microsoft Office 2016 Word, Excel, OneNote Book - Vol 1 Explore Microsoft office word, excel, onenote, skype for business, & one drive, create letter, worksheet, digital notes, make meeting, call, conference, include cloud storage. Microsoft office professional application Word is used to create professional and elegant, letter, electronic documents, fax, agenda, adding various application tools and control, insert graphic, table, clip art, smart art, chart, ole object, design mail merge, and many more other controls and add effects on working documents. Microsoft excel is used to solve numeric calculation in row and column order, create numerical text worksheet, adding worksheet formula more than 300, apply worksheet control name goal seek, scenario manager, conditional formatting, data table, insert chart, shapes, import and export worksheet data, adding theme, colors and more, design professional digital notes, share and export notes, create graphical, textual, table, smart art, equation, sheet, draw pencil based notes information through one note application. Microsoft Skype is used for business to make instant meetings, business conference, live chat and other types of communication, store cloud document, save retrieves and modify one drive document electronically worldwide. Lalit Kumar Mali has been working in the field of Information Technology for almost two decades. He has done ‘O’ and ‘A’ level M.Sc/CS and ‘B’ level interim from the National Institute of Electronics & Information Technology (NIELIT). Over the years, the author has gained expertise in Windows, Linux, Unix, Mac and Android OS along with C, C++, Java, C#, F#, asp.net, java.net, Awak, Shell, FoxPro, visual basic.net. He has worked with open source technology for several years in exploring and authoring various topics and discussions about these technologies. At present, the author is working simultaneously as a computer instructor and as an equity and commodity trader.